is an Original Lore-Based Fantasy Sandbox roleplay, set in a Medieval time in a land called Malice. It heavily pulls from high fantasy ideas but is a distinguishable multi-genre role-play. 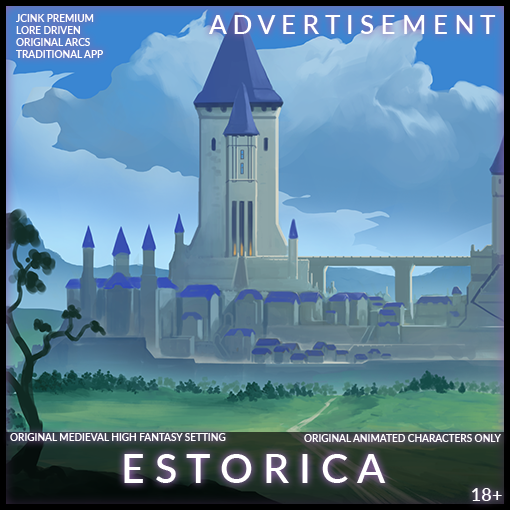 All of its characters, lore, and concepts are designed by the founders of Estorica and its members. The time and setting are shared by all characters, the events of one topic can have an effect on another topic, and the characters in either topic could never actually meet. Estorica uses a domino effect style in its setting where everything is connected, and things fall into place to complete the story.The possibilities are endless, and you as a player decide what you will do in response to the breathing world around you. This traditional, Play-by-Post setting offers brand new concepts and story arcs meant to challenge the norms of the medieval, High-Fantasy genre. An interactive game that’s managed by dedicated staff, waiting to help you and your fellow writers, guide the story of a wholly unique world. What more is that this story is just beginning: there are few collaborative frontiers left in the online writing world, and this is your chance to help pioneer the next! In the beginning, there was chaos, and from this chaos came creation and rebirth. Some creators called themselves gods for their creativity, while others would serve them and would never achieve such enlightenment. All was well until a new concept was born, this concept refused to be reborn and sought the understanding that the gods selfishly guarded. They locked it away in a cage called Malice. In time, the concept grew and learned. The concept achieved enlightenment. The concept created a being in her own image. She built us. Mother created the Orphans of Malice. Each Orphan was different, each orphan held different mindsets and opinions. The orphans, in their true chaotic nature, surpassed the gods in their creativity. This could not be allowed. Empires fell, Dominions were formed, Concepts evolved, and Gods were banished. The orphans, having no greater rivals turned to one another. When Mother gave us the gift of life, she couldn't have imagined how cruel we would become with it. In this life, you are a resource, a material and an asset, something to be molded to fit the needs of others. We are the beings that walk the earth, the sovereigns that rule the land, the beasts that stalk the trees, and the ore that crafts the swords. Nothing has changed. There is no such thing as freedom here unless you embrace the cruelty unless you embrace the cycle. The cycle of creation, of pain, of subjugation, and of death. You were not the first to be thrust upon this ground, and you will not be the last. Make your choices, and make them quickly, else the world shall choose for you. Will you be a slave? Or shall you reach towards the impossibility of freedom?